Do you love a nostalgic Christmas? I certainly do. There is nothing like turning on good ol’ Bing Crosby or Andy Williams to decorate for Christmas. That is part of the reason that I love to use vintage Christmas decorations in my holiday decor! 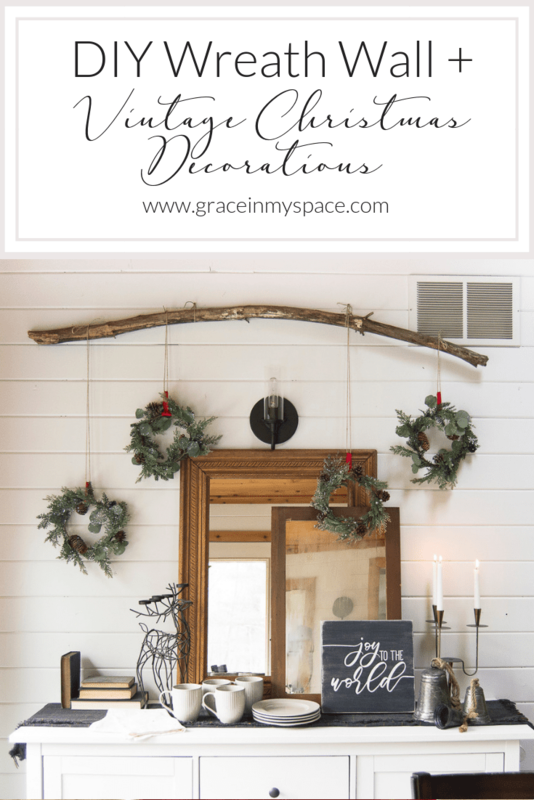 Today, I’m sharing a few ways to incorporate vintage items into your Christmas decor. Plus, I have a little bonus! I’ve created a super affordable DIY wreath wall as my backdrop to my vintage goodies. I love vintage ornaments, homemade Santa’s, and the character that comes from using items of the past. I talked all about why I love vintage decor in a previous post, but suffice to say that it is my favorite thing to decorate with. And Christmas is no exception! I showed a sneak peek of this space in my recent post on how to use everyday dinnerware for your holiday table. So today I thought I’d share more of the details. For this simple buffet I layered two vintage mirrors alongside a vintage candelabra and antique books. I just love the character and patina that they all bring. Typically, cozy decor comes in the form of textiles. However, when using vintage decor you can infuse that cozy feel into your space with shiny metals, aged pages and warm wood tones. Vintage Christmas decorations can be found so many places. My favorite place to visit to hunt for these treasures is flea markets. I purchased this large mirror for $5, the small mirror for $1 and the candelabra for $1. The books were gifted to me by my mother who has a beautiful collection. I love how they seamlessly blend with current day decor. Also, when you are planning your holiday decor make sure to think beyond traditional Christmas decor. 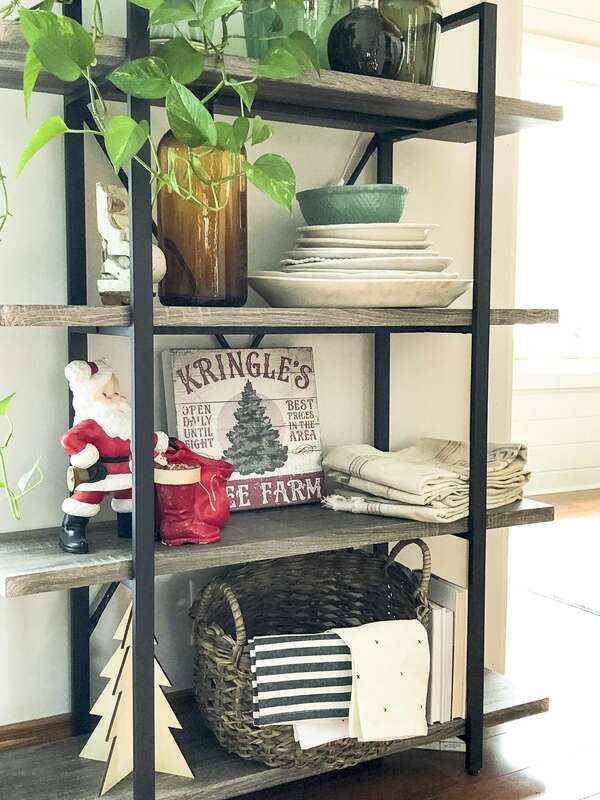 Incorporating vintage grain sacks, bottles and signs (even ones that are new but appear vintage) is a great way to stretch your decor through the seasons. I’ve added my grandmother’s homemade Santa to my vintage Christmas decor. He’s a jolly addition, don’t you think? 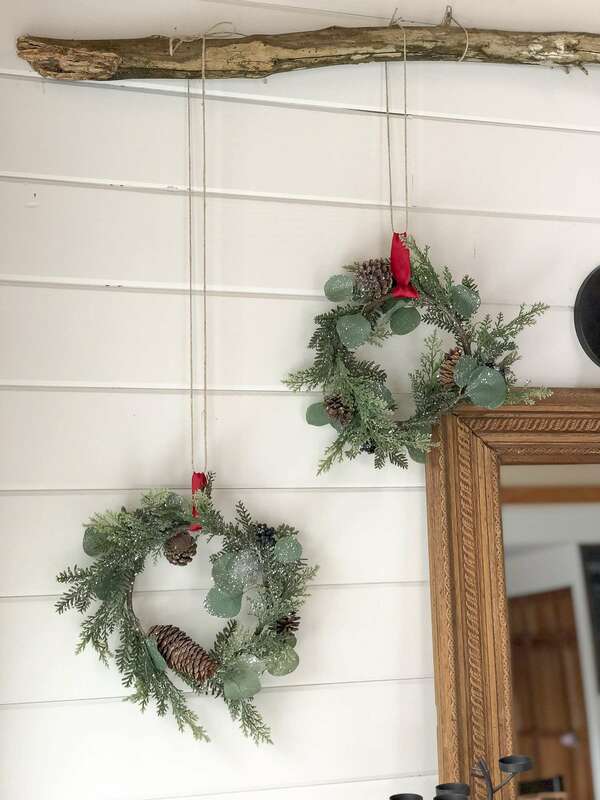 And, as the backdrop to my vintage decor, I’ve created this super easy and affordable DIY wreath wall. This cost me $20 total and fills the entire wall. I simply gathered a large branch from my yard to begin. Next, I secured it to two nails in the wall with twine. And then I simply draped four mini-wreaths at varying heights across the branch. These add interest and frame the decor below them. 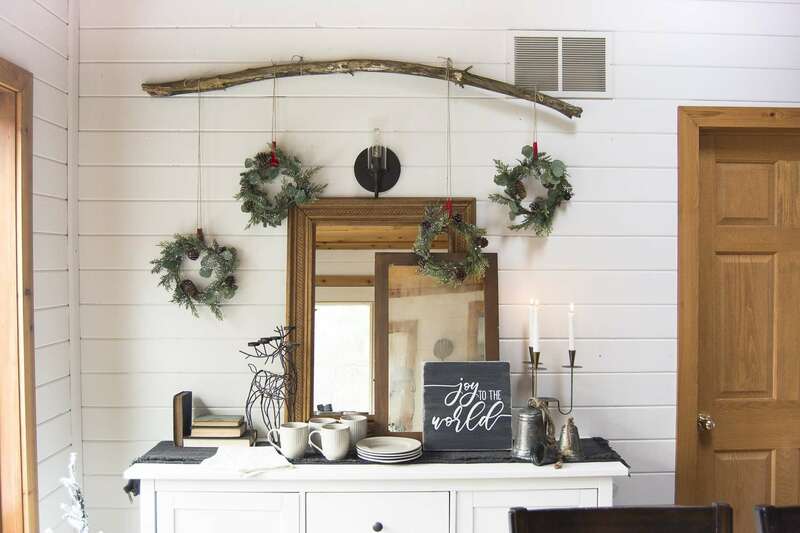 This wall decor idea is something I hope to stretch through the seasons. It will be perfect for the winter! You could also drape items you may already have on hand. 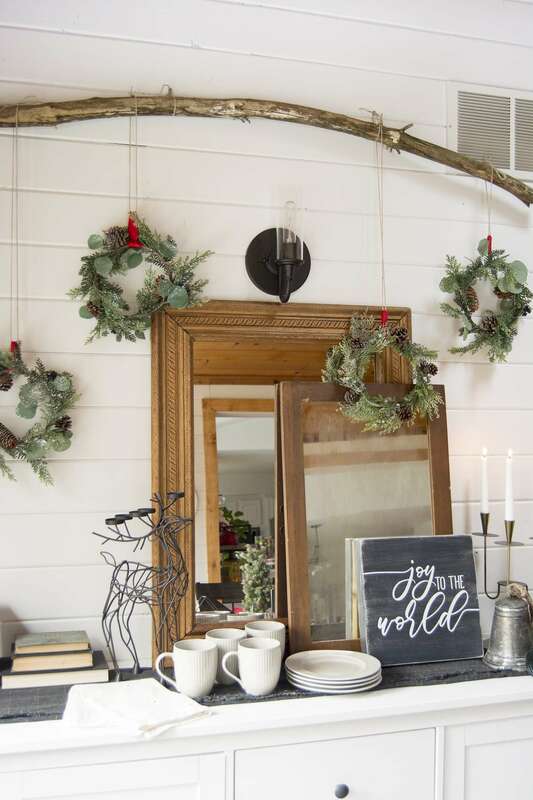 Perhaps ornaments, homemade snowflakes, or just fresh garlands could be great options. 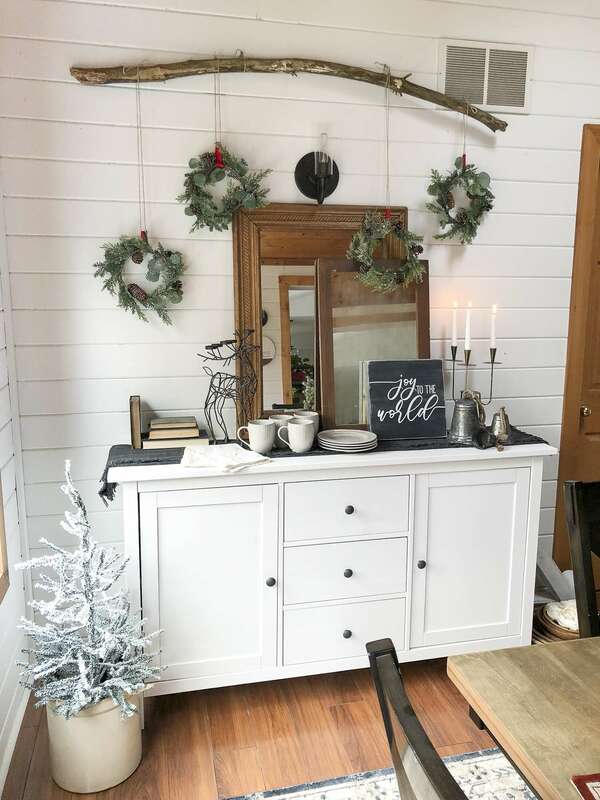 I hope you enjoyed reviewing some ways to add vintage Christmas decorations to your holiday home! If you decide to attempt a branch wall decor DIY then make sure to show me by tagging me on Instagram! I love seeing how you take my ideas and make them your own! Be blessed my friends!